I think Bigfoot lives in my backyard. That may sound like the strangest thing you’ve ever heard, but if it’s not Bigfoot it’s something incredibly big, ugly, and dangerous that’s back there. It’s one of the reasons I hate the backyard. When my wife and I were looking at houses back in 2000, we saw a lot of houses that just didn’t quite work out for us. Some had one beautiful room and that would be it; others would have one floor that was immaculate but another floor that looked like squatters had taken over. We did see a couple houses that were pretty nice, but we just couldn’t pull the trigger. Then one evening, after almost signing papers for a house that we really didn’t want, I decided to go online to see if I could find something I liked. In less than 15 minutes I actually did see something I liked. And one of the strangest things is that it happened to be on a street that I knew very well from my childhood; okay, from my teens, which wasn’t quite my childhood. The next day we called the realtor and asked her if she could set something up so that we could go and take a look at this house. When we saw the house in person, we thought it was pretty neat. It’s a ranch style house, something I’d never thought about ever living in, but it had this look that we liked. It had been on the market for a long time, and the price had been reduced, and my wife and I being kind of green when it came to houses thought that we were getting a steal. Truth be told, if I had listened to my Spidey senses the day before we signed the papers we might not have ever bought this house. Oh sure, every house has issues, and I can say this house has certainly has a bunch of them. One of the strangest issues this house has had has come from the critters. My dad and I took a walk around the house, and for the first time I saw the mosquitoes. There were a lot of them and they were large, to the extent that my dad commented on our Jurassic Park mosquitoes. He wasn’t kidding, and we’d see mosquitoes in the past. I started to wonder what we might be in for by buying this house, but we went through with it anyway. It took us two months to move into this house because we still had two months remaining on the lease for our apartment. It also gave us time to move things over a little bit at a time and to take our time in painting the place. During those two months I learned that I did not want to be outside at night when it was warm. I say that because I saw some of the largest and strangest bugs I had seen in probably more than 20 years of my life, and I saw those things briefly at the State Fair. I say briefly because I don’t like bugs; actually, I have a great fear of bugs of any size, so seeing large ones really didn’t enchant me all that much. Still, the house was coming along fine and we were pleased as punch (whatever that phrase actually means) to finally move in. I was overjoyed because I never thought I would own a home. We moved in on a Saturday, and got acclimated to the house pretty quickly. The first Friday evening in the house my wife happened to be working a second job, so she wasn’t coming home until really late. I was sitting at the desk of what became my office when I heard a noise in the backyard, as it happens to face the woods out back. Oh, I neglected to mention that we have woods behind the house. I would call it a forest but my wife would say my words were overkill. In the middle of the woods somewhere is a swamp and a stream of some kind; we’ll come back to that. The noise. I swear to this day that it was some kind of loud, dangerously threatening growl. I don’t know what kind of growl, but I know it wasn’t a dog. I also know it was kind of loud, and it sounded like it was close to the house, and I didn’t like it. I probably didn’t do what any other man would’ve done, based on the few scary movies I’ve seen, because my sense of self-preservation kicked in. I got up from my desk without looking out my window, walked across the way into the master bedroom, closed the door, and sat down on the bed. I took a quick look at my window in the bedroom to make sure the curtain was closed, which it was, and I just sat on the bed for a bit. I didn’t turn the TV on because I wanted to make sure I could hear the glass breaking if Bigfoot happened to come through the window. I sat there for about an hour, and of course Bigfoot didn’t come through the window, but that doesn’t mean that Bigfoot might not be out there somewhere. I do know this; we have all sorts of other critters out there that have been quite interesting and at times scary, things I had never seen when I lived in this area many years ago. Trust me, when I was a teenager if I had seen even one of the things that I see now on a regular basis, or at least know is out there because I have seen it at one time or another, there is no way I would’ve ever bought a house in this neighborhood. What have I seen? The two things I’ve seen most often are the deer and the rabbits. I can handle the rabbits and most of the time I can handle the deer, but I hate the deer when they decide to run across the street while I’m in the car, and that has happened a few times including right in front of the house. I see the hawk that likes to circle the sky, although truthfully I can’t tell you if it’s the same hawk all the time. I saw my first chipmunk only a few years ago, and now we see those things all the time, as one of their favorite hiding spaces seems to be a little space underneath the siding in the front of the house. I’ve seen squirrels, snakes, frogs, foxes, coyotes (or coy dogs; I can’t tell the difference but I hear we have both and they both have big paws), turkeys, turkey vultures (some of the biggest and ugliest things you’ve ever seen), skunks, opossum, those big fat fuzzy things that run very fast that might be groundhogs, the largest crows I’ve ever seen, moles, mice, and of all things something called a star faced mole, which ended up in our basement. The exterminator we called to come verify it didn’t believe us until he got to the house and looked at it, then said not only are they very rare but that it’s extremely rare that they end up in a house because they can’t see, which was why he didn’t believe my wife when she told him she thought that’s what it was (the Internet can be a wonderful thing but when I saw a picture of this thing I wasn’t very pleased). So I haven’t seen Bigfoot, and I haven’t seen a bear, which supposedly was running around this area a couple of summers ago, though slightly north of here. Based on some research, I don’t think there’s a bear in the swamp for two reasons: one, because bears don’t like swamps; two, because that sound I heard all those years ago didn’t sound like the kind of noise that bears in this area would make, or so I say. I know the noise didn’t come from a coyote because coyote sound like women screaming, and I know it wasn’t the fox because the foxes sound like little dogs. I also have never seen the bats that I know have to be out there, but they don’t roar. We’ve never seen the mosquitoes as thick as they were the year we moved here (probably because we cleaned up the area and hired a guy to maintain it), but I’ve seen some very weird and ugly creepy crawlies that just make my skin crawl. And what’s the deal with the ladybugs? My wife said she’s seen a quail, and of all things, we also think there might be some storks or cranes or whatever those things with the really long legs are from time to time, which we see at the lake. Strange, but for all the seagulls in the area, we’ve never seen one setting down in the neighborhood. But none of these things growl, so I know it’s none of them anyway. The reason I keep thinking it’s Bigfoot is because I remember a movie from 1973 called the Legend of Boggy Creek that scared me so much I was afraid to walk home, and I would swear the noise I heard sounded just like the noise that Bigfoot made in the movie. I remember that night because I swore I heard Bigfoot following me, even though I lived on an air force base, and I ended up running home, which was the first of two times I ran home (I also ran home when I left the movie Night of the Lepus early; I can handle aliens but these things?). Wow, I don’t know where to start with my advice, but I surely have some. First, go to the garden center and buy some preying mantis eggs. PMs are the best line of defense against a variety of insects. I know they’re scary looking mofos, but would you rather have 1 really scary bug or millions of others? Next, there probably aren’t many or any bats if there are that many mosquitoes. Try building a bat box to lure some into forming a colony in your yard. You can also go to Home Depot and buy mosquito dunks for that swamp, to help keep the bugs down without bat interference. 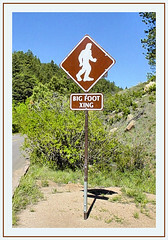 Lastly, based on your extremely scientific report, I’m pretty sure you didn’t hear a Bigfoot. All the signs point to a chupacabra. Good luck with that! Well Cairn, I always thought the chupacabra was a southern thing, and since I live in NY I know it’s not that. And in my mind praying mantis’es (no idea how to write that plurally) are bugs, just bigger bugs, and the only good bug is a dead bug; nope, no way, ain’t happening, and since it’s illegal in NY to kill them someone would be calling the cops on me in no time (actually I wonder if that’s still law here). And there might not be bats in the woods (I’m not going to find out) but we do have bats in the area because I’ve seen them flying around the lights at the bowling alley (one reason I gave up bowling lol) and I’m always hearing tales of someone living further out in woods ending up with one in the house (ugh!). Mitch, this is highly probable. You are decent, trusted and reasonable person and there are so many people that have seen “BigFoot” or a creature that isn’t described exactly as any known species. I personally have seen a fish high in the mountain that looked pre-historic. Hehe, a small one that looked more like reptile than a fish. Actually my father saw it too. Well Carl, After 14 years in that house and no return visit, and the “fact” (yeah, like there are facts) that Bigfoot actually likes warmer weather (without a parka he couldn’t handle our temperatures or our snow) it probably wasn’t him. 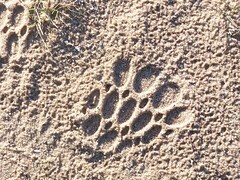 However, one day we did find these very large paw prints, and that’s how we discovered the first time that we had coyotes in the area, which freaked me out initially. But of all things those suckers are scared of the alarm lights we have out back that come on when things get in its field of observation, which is funny because the foxes and deer don’t seem to be phased. This is a grand story very well told. My compliments to you Mitch. When we bought the home that I now live in, we went through some of the problems that you mention, but change deer to snakes and mosquitoes to huge frogs. The locality was originally farm land converted to residential plots and every monsoon we had all kinds of creatures crawling into our garden and sometimes into the homes as well. Civilisation eventually caught up and they have all disappeared. I particularly miss the sparrows that used to come every morning and chirp away till my late wife would give them their morning quota of bird seed. We occasionally see eagles but there is no food available for them and so, it is very rare to see them. Rummuser recently posted…3 Days To Kill. Sounds like you live in a very interesting house Mitch, except for the bugs that is 😉 It must be great living so close to mother nature. Some people would kill to live in such a place. Do you have a spare room that you can rent out to all those tree huggers/nature lovers out there. Sire, I have 5 bedrooms, but still I’m not taking in boarders. lol For me, it’s not great living this close to Mother Nature; I should have known better. So, does that mean you don’t go for walks in the woods? Okay Mitch, I’m SO proud of you for walking back in those woods and video taping your journey. From the sound of it it’s not something you’ll ever do again and I’m shocked you did it in the first place. I kept laughing when you said “well looky here. I never knew this was here”. Hell no, you’ve never been back there. That’s too funny my friend. I’m really surprised that you are afraid of bugs. I don’t like them but I’m not afraid of them. We have rats around us but we have traps out to catch them. They live in the sewers but when it rains they all like to come up and it’s not fun. They are nasty creatures but I’ve never had them in my house and they’ve never bothered me. Not sure I would like all the sounds of your creatures so close to home but I guess if you live there long enough you get use to them all. I think your backyard is cool and I would be out there often, without the mosquitoes of course. Does Big Foot live back there? I don’t know but I don’t think I’d be too curious to go find out either. I’m brave but not that damn brave. Wow! This is so scary Mitch. I remember one when I was a little we also lived in a house that has a huge backyard with lots of mango trees. It’s very creepy out there. During our first week there when we haven’t set up lights in our backyard yet, we always hear a noise like someone’s walking there. We are not sure if its an animal or a person. Good thing, no foot prints because that would surely make us leave the house immediately. But we eventually leave the house after almost 5 years of staying there. I admire you being so brave! Kudos!